Comet Holmes had long passed its closest approach to the Sun and was already on its way to the more distant stretch of its orbit at a distance of around 150 million miles from Earth. Suddenly, on 24 October 2007, this tiny obscure magnitude-17 rock experienced a dramatic outburst leading to a million-fold increase in brightness. The following days it continued to brighten and became a magnitude 2 object in the night sky - easily seen with the naked eye. At the same time, its tiny star-like nucleus expanded into a bright sphere of dust and material illuminated by the sunlight. It is quite an extraordinary event to occur. We will probably never know what exactly caused this transformation - some people hint at a possible collision, others theorise the cause of this event to be the sudden implosion of a mostly hollow comet. At the time of capture of the image above, the comet shell of dust was expanding at a constant rate of 575 meters per second (1,300 miles per hour), as evaluated by F. Colas and J. Lecacheux at the Paris Observatory. Here is another shot taken a few days later - the coma has continued to grow to a size greater than the Sun. 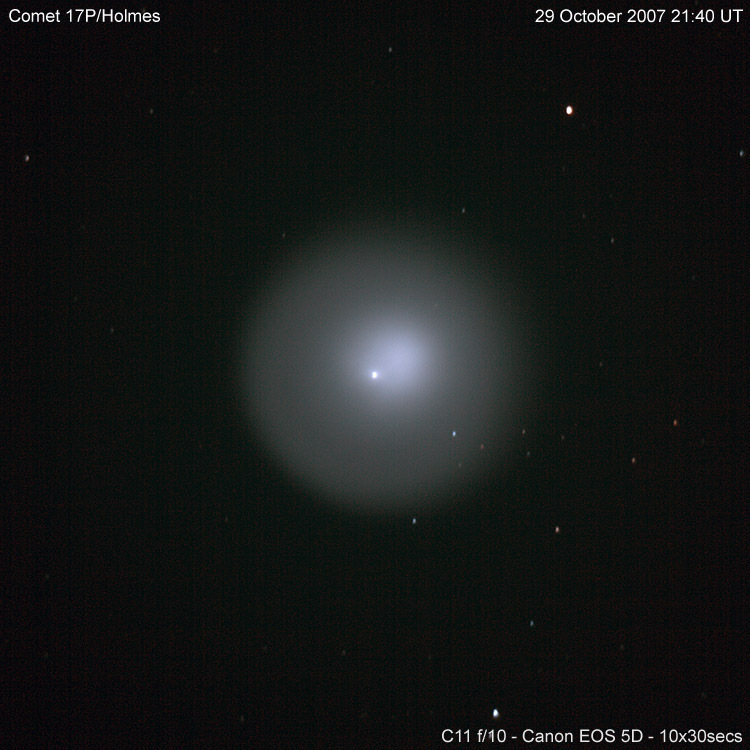 Therefore comet Holmes with its coma has become the largest object in the solar system. 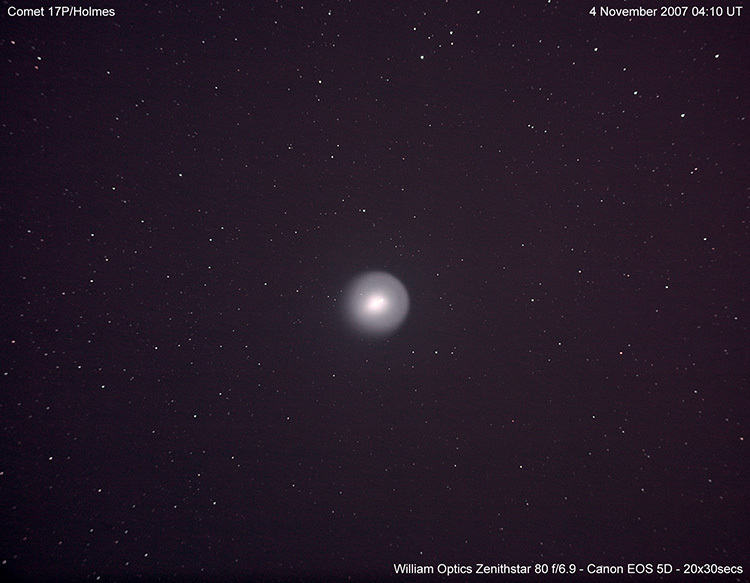 This wider angle view through my William Optics 80mm refractor offers a sense of perspective of this comet undergoing these dramatic events on its journey against a field of background stars.